It is a well known fact that building an extension to create additional living space will substantially increase the value of your property. There are many reasons why home-owners create extensions; for example, you may want to create a bright morning room with patio doors where you can enjoy more sun in your home; a playroom for new additions to the family; or an annexe to cater for a new hobby. In our experience the most popular reason for an extension is to expand the size of a kitchen or dining room. Whatever your reasons for building an extension, it is essential that you are aware of the relevant planning regulations before commencing any works. Failure to adhere to the regulations may result in you becoming entangled in a lengthy and costly legal dispute with your local council who may issue a demolition order. Drawing and Planning have extensive experience in gaining planning permission for our clients seeking to expand their homes. Not all extensions require planning permission. Under new rules that were introduced in October 2008 some extensions are permitted without the requirement to submit a formal planning application as it is granted automatically under "Permitted Development Rights". Although permitted development rights are intended to be universal across all local authorities as they derive from a general planning permission granted by the government, interpretation by local authorities may vary. The extension will cover no more than 50% of land around the "original house". The extension will not be forward of the principal elevation or side elevation fronting a highway. The extension will not be higher than the highest part of the roof. A single-storey rear extension will not exceed a maximum depth of three metres beyond the rear wall for an attached house and four metres beyond the rear wall for a detached house. A single-storey rear extension will not exceed a maximum height of four metres. A multi-storey rear extension will not exceed a maximum depth of three metres beyond the rear wall including ground floor. Eaves height of an extension within two metres of the boundary shall not exceed three metres. Eaves and ridge height of extension shall not exceed the height of the existing house. Side extensions should be single storey with a maximum height of four metres and not exceed a width of half the original house. Two-storey extensions shall be no closer than seven metres to the rear boundary. The Roof pitch of extension higher than one storey must match existing house. Materials must be of similar appearance to the existing house. The extension will not include any verandas, balconies or raised platforms. Upper-floor, side-facing windows must be obscure-glazed with any opening to be 1.7m above the floor. At Drawing and Planning, we are well aware of what is likely to be granted in each particular borough, and always bear this in mind when compiling our designs for your extension. We offer a standard Permitted Development Package which covers all the elements you will require to gain approval to build an extension. If your property is in a conservation area, your permitted development rights are more restricted than other properties'. Under your permitted development rights, an extension to a property in a conservation area is restricted to being a single storey rear extension and cannot include any side extension or exterior cladding. It is very possible that your proposals for an extension will not meet all the restrictions to be considered permitted development. You may want to extend to a greater depth than the allowance permits, or perhaps you are thinking of creating a front facing dormer or extension. You could also be considering the addition of a raised decking platform, a balcony or a veranda to complement your extension. In whichever way your plans may differ from the restrictions, even the use of alternative materials, you will require planning permission prior to commencing any works on your extension. It is to be forward of the principal elevation or side elevation fronting a highway. It is to be higher than the highest part of the existing roof. A single-storey rear extension is to exceed three metres beyond the rear wall for an attached house and four metres beyond the rear wall for a detached house. A single-storey rear extension is to exceed a height of four metres. A rear extension of more than one storey is to exceed a depth of three metres beyond the rear wall. The eaves height of an extension are to exceed a height of two metres of the boundary of three metres. The eaves and ridge height of extension are to exceed the height of the existing house. A single storey side extension is to exceed a height of four metres and width of more than half that of the original house. A two-storey extension is to be closer than seven metres to rear boundary. The roof pitch of an extension higher than one storey do not match existing house. Materials used will not be similar in appearance to the existing house. It is to include any verandas, balconies or raised platforms. Upper-floor, side-facing windows to be clear glazed; any opening to be lower than 1.7m above the floor. If you have lived in a conservation area for some time you are likely to be aware of the regulations and how these can affect home improvements. However, if you have recently moved into the area it is most likely to be new to you. That being said, one of the reasons that you purchased your new home may well have been the character of the area and the preservation the conservation status has provided. It is important to note, conservation areas are not intended to lock an area in the past as a form of living museum; new development is often permitted but it will have to be undertaken sympathetically to conform to the existing environment. In a conservation area you will require planning permission for most extensions. It is absolutely necessary to obtain the required conservation area consent prior to beginning any works. Going ahead without this may result in a fine or imprisonment, or both. Should you need planning permission for your extension, we would be glad to assist you with all elements of your application. If you would require drawings only, our in house architects can provide you with detailed existing and proposed drawings for all types of extensions. 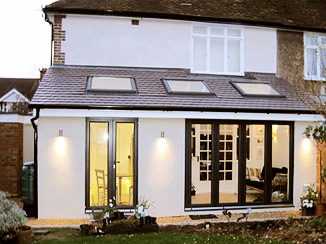 Call Drawing and Planning Today on 0208 202 3665 to find out how we can help you with your extension. Do I need planning permission for an extension is kind of an open ended question. There are some types of extensions that will not require a planning permission. However, there are other types that will require a planning permission for extensions. Being able to differentiate between the two will make a huge difference in the construction of your extension project. Adding an extension to your home, regardless if it is a rear or a side extension can provide you with some extra living space, and increase your residences value. Planning permission for side or rear extensions will be needed if your extension does not follow the guidelines given by the planning committee. If your extension is going to extend a large depth than the allowance permits, or the extension will be facing towards a front dormer, then you will need to get planning permission. Also, if the extension is going to be using a raised decking platform or a veranda when it is complete, then you may require some type of permissions before the project can be completed. If you are able to keep yourself within the guidelines of building an extension onto your present residence, then no permissions will be needed. However, if you are afraid that your extension will not meet code without permission, it is best that you obtain permission before undergoing any type of alterations on your property.